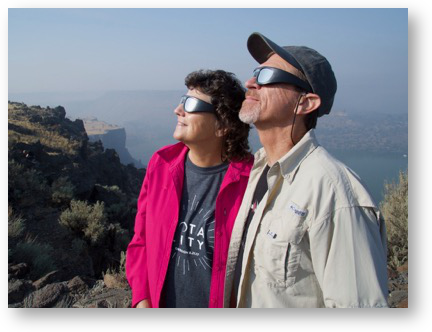 How Do You Capture a Total Eclipse … and Still Experience It? You might have heard that a total eclipse of the sun traveled across the United States on Monday the 21st of August. Steve and I were lucky enough to witness it as our second total solar eclipse. My first answer is, don’t try. Seriously.Experiencing a total solar eclipse is a very emotional event and is best if absorbed in a completely analog way. In 2012, Steve and I went on the Mac Mania/Sky and Telescope cruise that traveled from Australia across to New Caledonia to intercept a total solar eclipse. While on the ship we met our now dear friends Devon and Maryanne, and joined up with our long time friend, Jean McDonald. On the day of the eclipse on the ship, I was so focussed on trying to capture the eclipse on my camera and I really missed the grandeur and amazement of what I thought was a once-in-a-lifetime event. I was fussing with aperture and shutter speeds and filters and timing of when to have the filter on and off, while others were living the event. After we saw the eclipse in the Coral Sea, Jean said that we should all get together for the next one, which was going to pass over a few hundred miles from her home in Portland. Steve and I immediately signed up for that idea! Fast forward to the eclipse that enchanted North America this week. We flew to Portland to stay with Jean and then traveled together down to Bend, which was an hour’s drive south of the path of totality. We spent a day scoping out possible spots to view the eclipse and found a few little lookout points in Cove Palisades State Park near Madras. We could see Mount Jefferson to the west and a beautiful gorge below us where we hoped to see the shadow fly across at 2400 mph. But the view wasn’t the best part; this place had porta potties! The porta potties were a critical element because our plan was to get up at 2:30 in the morning to ensure we successfully got a spot to watch the eclipse that wasn’t going to start until 9:06 am and finish at 11:41 for us. Now that I’ve set the scene, let’s talk about how Steve DID capture the eclipse but in such a way that he still fully enjoyed and experienced the event from an emotional perspective. After the great backpack theft of 2017 from Peru, we replaced his camcorder with a Panasonic HC-V770. This camera is only 1080p, but it has a 50x optical zoom. He mounted his camcorder on his Manfrotto tripod. Months before the eclipse, he also ordered a solar filter and a stepping ring to match the 49 mm diameter of his camcorder’s lens. He settled on the HOYA ND100000. It was on back order for ages, but he got it about a month before the big show so he was relieved about that. The problem with celestial photography is that the earth is rotating and the stuff in the sky is rotating. The moon and the sun are moving with respect to each other as well. Unless you have a fancy pants tripod with a motor drive to follow the objects in the sky, you can’t zoom up on the eclipse to get the best picture, AND record it for two and a half hours. And of course you don’t want to be hand rotating the camera on the tripod during the eclipse because a) that would look awful and jerky, and b) it would not allow Steve to enjoy the eclipse if he was fiddling with his camera. This is where Steve got tricky. While we were waiting for the eclipse to begin, he set his camcorder to maximum zoom and positioned it to have the sun in the bottom left corner of the frame. He then timed with his Apple Watch how long it took the sun to go to the opposite side of the frame. He measured it as 6.5 minutes, and noted that the sun left the frame partway along the right side of the frame, not the upper right corner. He divided 6.5 by 2 to get 3.25 min to travel from the corner to the center. Then he estimated half of the distance up from the corner as it left in his first test run. He did a second test run and confirmed that in 6.5 minutes, the sun traveled from the lower left to upper right symmetrically for a pleasing view. There’s another tricky bit to recording a total eclipse. While the sun is even partially visible, you have to have the solar filter on, or you’ll damage the sensor on the camera just as you’d damage your eyes. But when you have the rare opportunity to view totality, where the moon and the sun align perfectly, you don’t need a solar filter, and if you keep it on, you can’t see anything at all. So in order to capture the waxing and waning eclipse as well as totality, you have to have the filter on during the partial phase and remove it for the full eclipse and then put it back on again. To minimize the time taken to remove the filter and camera jiggle during the event, Steve put his solar filter on with only a half turn of the threads, and practiced taking it off quickly and replacing it. The next piece of the puzzle was timing. If he had to be watching carefully and thinking about the camera, that cognitive load would remove him from the grandeur of the event. Since we knew precisely when the eclipse would start, when totality would begin and end and when the entire eclipse would complete, he could set timers to tell him when to take action. First Contact was at 9:06am and 43 seconds, and he made a few recordings during the early phase of the eclipse. It’s pretty hard to see precisely when first contact occurs so a timer wasn’t necessary. But the real show is totality, and that was definitely going to be time critical. The moon during this eclipse appears slightly larger than the sun, but the sun’s corona is bigger than the moon. During totality you can see the corona as a ring of fire around the moon. But before that, at Second Contact, which is when one edge of the moon just begins to completely cover the sun, there’s a brilliant flash of light. 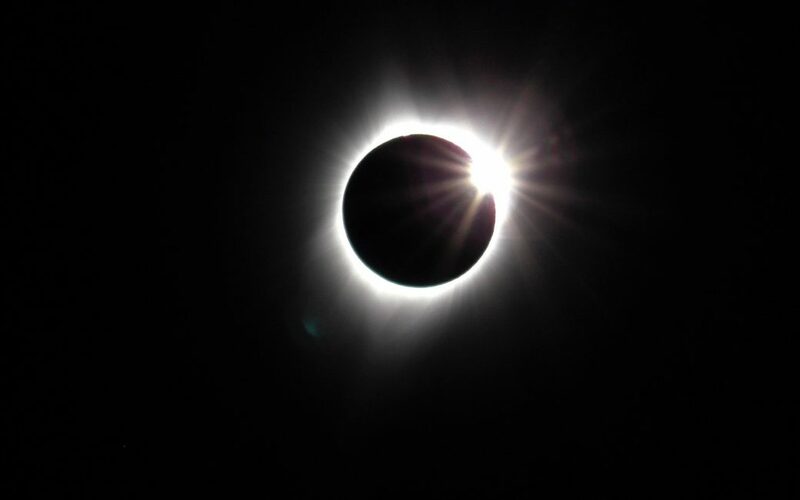 This flash of light is called the Diamond Ring, with the last part of the direct sunlight appearing as the diamond and the corona around the rest of the moon as the ring. Now think back to Steve and his tricky timing. He can record for 6.5 minutes, and totality at our exact location was 1min 55 sec, with the midpoint of totality being at 10:20:21. He backed off 3.25min from the midpoint to get to the start time to record totality. Then he added 15 more seconds, and set an alarm on his watch as a reminder for him to be ready to remove the solar filter. So he got to watch the partial eclipse, and when the sun was just down to a tiny sliver, he heard the alarm go off on his wrist. He was able to whip the filter off with minimal disruption to the video and no damage to the sensor, take off his own solar glasses, and most importantly he was able to watch the diamond ring and exclaim with excitement about the wonder above us. On the other side, Third Contact makes a second Diamond Ring effect, and on that side he just put the filter back on right when the Diamond Ring was done. When we got done doing high fives with the crowd, drinking sparkling wine with chocolate cupcakes brought by Jean and slogging through a couple of hours of traffic with hundreds of thousands of our new best friends, it was time to take a look at the video. He’s still working on the video to get just the best of pieces, but he did something else really cool. 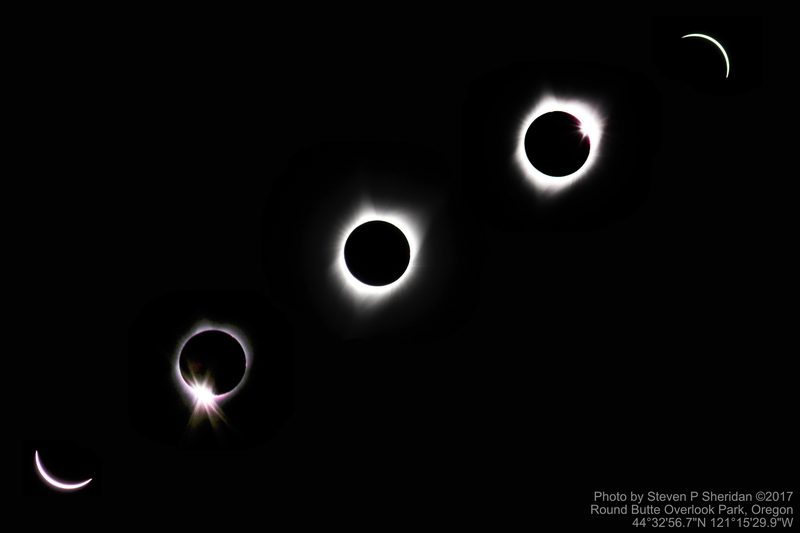 As I mentioned, the video camera is only 1080p, but he took five screen captures from the video and together we used Affinity Photo to create a collage of five stages of the eclipse into one beautiful image. I’ve tried to create collages like this before in other applications (and failed) but with Affinity Photo it was a dream. He cut out small squares of each picture of the sun/moon combination, and then we plopped them onto a blank canvas layer. He arranged them across a diagonal to get the right feeling of progression. Each picture was a different size because during totality you can see the corona and light flying out to a much bigger area. He erased bits of each rectangular picture so none of the suns were covered up. Then we used the eye dropper to grab the black sky color from one image and made the background layer that color of black. Of course the five images weren’t all exposed the same because some had the solar filter and some did not. But it was a quick matter of lowering the brightness on some layers and increasing the contrast until all the blacks matched. The resulting photo that Steve was able to create is phenomenal. We’ve had several requests for high resolution versions so he’s agreed to post the full resolution image (4000 x 2667 px) in this post. 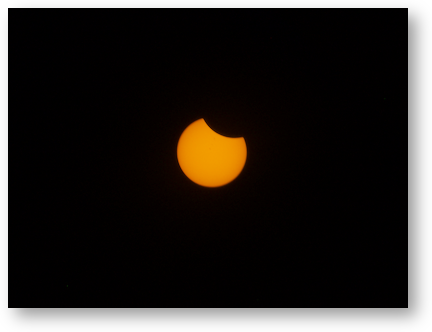 Being a geek, I’ve talked about everything BUT what it was like to see a total eclipse of the sun. When we first arrived, a very young man named Greg walked right up to us and said hi. This crazy kid decided on Saturday morning to drive 8 hours from San Francisco to see the eclipse and just got lucky enough to pull over in complete darkness and find this spectacular spot we’d spent hours discovering. Then we met a young woman named Melanie who had camped nearby with her mother Jeannie. She told us that she had been planning on this trip for 10 years! She couldn’t have been more than 25 years old so that was a significant portion of her life. Then Rohit and Priya came over to hang out with us. 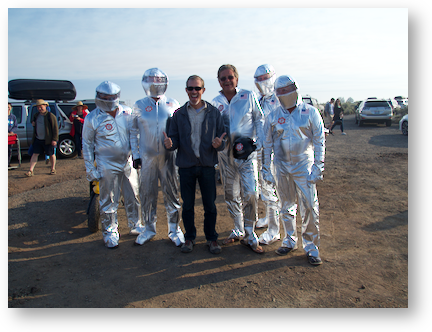 Steve even met a bunch of guys who rolled up on their scooters wearing space suits. We met a lot of other people, but it was somehow still an intimate experience because we were all sharing something significant that day. One thing that you don’t hear talked about is how spooky it gets right before totality. The darkness isn’t like night. It’s somehow other-worldly. I think the spookiness is caused by how cold it gets. I’m not sure about this theory yet, but I think that the sun heats the earth. But seriously, it’s freaky to have the temperature drop probably at least 15 degrees in a matter of seconds, all while the sky turns dark. That effect definitely causes a feeling of something dramatic about to happen. Remember Melanie, the young woman who’d planned to see the eclipse for 10 years? When the totality was finally upon us, she started to cry. It had a huge impact on me to see it through her eyes. I hope that gave you a feel for what we experienced. The picture is awesome! Great job. I had the most incredible view of the totality. I remember that during a partial eclipse that I was under (very partial, only half coverage or so) the color of the light changed significantly, taking on a hue unlike any twilight. A very interesting endeavour, it seems, would be to try and record video showing that spooky light. I don’t know if that can be done, it may be impossible. Human eyesight is very sentive to color subtleties, way more than any camera is capable of. Also, today’s camera’s do on-the-fly color balancing stuff. That’s great for steering the user clear of taking pictures with wrong color balance, but it acts counter to capturing _change_ of color of the ambient light. About photos of the eclipse itself: it seems to me that intellectually you know that there are going to be scientists out there with equipment that is taking pictures that are better than any general camera can take, and that those images will be available via Internet. But clearly there is a profound urge to take pictures with the camera that you are holding yourself. I mean, if some day you see a Unicorn, and you are the only person around, you’re the only witness, then you will be desparate to take a picture because if you don’t then there won’t be any picture. By contrast: with the solar eclipse there were tens of millions of people taking the very same picture. Intellectually you know that taking a picture of the solar eclipse is kind of a superfluous thing. But of course that’s not the point. Clearly, what matters is that the picture you have is taken with the camera that you are operating yourself. You bring up some interesting points Colin. I agree there is something about capturing the special moment yourself, but I would still recommend not spending much time photographing/recording an eclipse and instead appreciate the experience directly as much as possible. In my case, I felt I could afford the 2 seconds to remove and reattach the solar filter to my camcorder. That was about the longest I was willing to divert my attention away from the spectacle. Regarding the spooky light effect during the eclipse, I think there are three factors going on: 1) light turns to dark (and vice versa) much more quickly than we are used to, 2) unlike sunrise or sunset where the diminished sunlight travels through a lot of atmosphere and therefore shifts to reddish tones, the reduced sunlight from the eclipse is coming from nearly directly above so there is no color shift as we see during sunrise/sunset, and 3) as the eclipse approaches totality the source of light becomes more point like and not distributed over the 0.5 deg arc we are used to from the full extent of the sun. As a result, the shadows become less fuzzy and much more sharp. In addition to the visual effects, there is also a cooling effect that adds to the spooky factor.